One of 2006's most unexpected indie success stories, Beirut (aka New Mexico-born 19-year-old singer/songwriter Zach Condon) combines a wide variety of styles, from pre-rock pop music and Eastern European gypsy styles to the alternately plaintive. 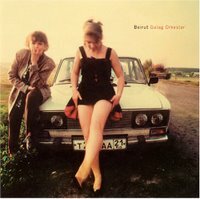 another great new music with Beirut debut "Gulag Orkestar" that expand to the world as they deserved. Like DeVotchKa, Condon is heavily influenced by Eastern European folk music and mostly accordions, horns, and hand percussion stand front of his music.Also I have no word to voice of Zach Condon who really knows how to blend his name with flowing of the music. "Gulag Orkestar" generally touches some gloomy senses and these senses came out of his shell. The plaintive music already is a reason to fall in love Beirut but it's obvious lyrics were written too simply and lyrics aren't in same range with heavy dominant exuberant instruments.It happens at every listen,delirium!Impressive thunderous instruments (Prenzlauerberg),colourful good times,aspiration (Postcards from Italy),lyrically weak but it's heartland song of the album (Rhineland (Heartland)),don't surprised if you find yourself singing with him.I noticed that "Gulag Orkestar" had placed in my heart with its melodic indie folk tunes. I think you underestimate his lyrics.